As the final episode before the No Mercy supercard on 9th October, the 894th Smackdown Live saw Dolph Ziggler take centre stage as Intercontinental Champion The Miz premiered a new "Dolphumentary" and Ziggler's buddies from the Spirit Squad, Kenny and Mikey returned. With a supercard just days away and the likes of World Champion AJ Styles, Women's Champion Becky Lynch, Dean Ambrose, Alexa Bliss and Jack Swagger all in major spots, this was going to great, right? 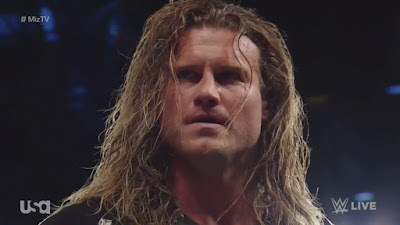 The heat on the Intercontinental Championship was turned up a notch as title holder, The Miz, presented a video package on No Mercy opponent Dolph Ziggler, that looked at some of the more infamous moments in The Show Off's career, before Ziggler fought off old pals from The Spirit Squad, Kenny [Dykstra] and Mikey [Mondo] in their WWE returns. I wasn't overly excited about Kenny and Mikey and the segment could have been just as effective without it, but it definitely gave the interaction a nice boost of nostalgia for the heady days of 2006. Whilst most of the coverage of this looked at the return, it was Ziggler and Miz would worked the hardest to keep stirring their feud up. Both worked when on the attack throwing verbal barbs, but it was when reacting to these barbs that the pair created their most effective work. Ziggler's frustration and aggression when Miz told him he'd be doing $5 autograph signings should he lose at No Mercy was the standout moment of an enjoyable scene. 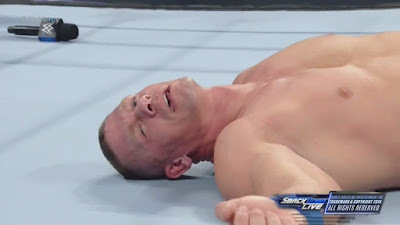 In a show that was full of talking, World Champion AJ Styles and #1 Contenders John Cena and Dean Ambrose closed the show, in what developed into Styles and Ambrose taking turns to take shots at Cena. There was a surprising amount of variety here as The Phenomenal One stuck to Cena's attempts at equaling Ric Flair's "World Championship record", whilst Ambrose went about questioning Cena's personality traits and his Hustle Loyalty Respect mantra. Both Styles and Ambrose brought strong performances to match the strong content, with the segment building nicely to Cena beginning the scrap without having to really say a word. The close of the show was a little paint by numbers, as all three men got a chance to hold the belt up, with Ambrose ending the show in control. There were ways of getting the supposed chaos of a triple threat match over without having to fall into the predictable and formulaic. The adjoining episode of Talking Smack was headlined by an appearance from Dolph Ziggler, as he discussed his match with The Miz at No Mercy and added some depth to the tie. With Ziggler's career on the line on 9th October, this was another fact and fiction mixing effort from The Show Off, which long-time fans may have become a little numb towards over recent years. Ziggler definitely has knack at getting his pacing and passion just right, this was only interrupted by Renee Young appearing to want to steer Ziggler in a certain direction. The style worked for the audience that would be watching Talking Smack, as you'd expect these to more interested in insider terms and therefore I think that the upcoming bout has been given an extra layer of interest, as this was more a look at how Nicholas Nemeth feels about his current situation in the company, than it was a look at his issues with Miz. After Alexa Bliss and Nikki Bella's singles match had ended in a no contest, thanks to Carmella interference, Daniel Bryan pulled a Teddy Long and booked a tag match with Bella being joined by Women's Champion Becky Lynch. The tag bout, managed to carry two storylines well, but couldn't have been called anything more than basic. Taking up just over 4 minutes, Bella worked in the face in peril, which mainly involved rest holds from Carmella & Bliss. There wasn't a lot to get excited about, but the San Diego crowd seemed largely into it, which at least gave a bit of drive when watching at home. Lynch's hot tag was probably the best part, featuring crisp exploder suplexes in quick succession and the finish gave fuel for the two upcoming supercard bouts as Carmella and Bella brawled to the back, whilst Bliss pinning Lynch gives her even more momentum heading into her title challenge. 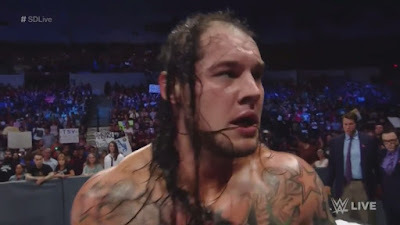 Round off the top part of the card, Baron Corbin suffered defeat to Jack Swagger in controversial fashion, as the referee called for the bell despite Corbin not appearing to tap whilst in the Patriot Lock. Despite the dodgy finish, I was surprised by the strength of this contest, as Corbin and Swagger put together some quality action. The story appeared to paint Swagger as the more powerful of the pair, getting the better of Corbin in the early stages, leading to Corbin having to resort to taking advantage of a rope break and then shoving Swagger into the barricade. This was well put across by the performers and managed to get Corbin a decent amount of heat, which was only added up when The Lone Wolf took his time during his beat down. The transition into the Patriot Lock, showed that perhaps with an extra five minutes and a real finish that Corbin and Swagger could do something good together. On Talking Smack, AJ Styles' interview with Renee Young and Daniel Bryan covered a variety of topics, with Styles handling the occasions well, adding to what he'd said at the close of Smackdown Live and ending with a passionate promo about defeating anyone Bryan or Shane McMahon put in front of him, because he's a winner. Bray Wyatt and Kane went through the motions, until Randy Orton appeared on the big screen upside down and Wyatt left to find out where he was, leading to multiple pre-taped backstage skits. The Hype Bros (Mojo Rawley & Zack Ryder) went over The Vaudevillains (Aiden English & Simon Gotch) in an awkward and cringey tag encounter, that also involved The Ascension standing about on the ramp and pointing a bit. Daniel Bryan introduced five female fund-raisers for Susan G. Kommen and presented them all with Women's Championship belts, in an emotionally charged in-ring event. The main storylines this week were well served as World and IC title stories carried the show, with two good segments. It was a shame that there was a distinct lack of wrestling as only Corbin v Swagger went longer than five minutes, which, of course, reflects on the rating. With this being the last chance to get people interested in the No Mercy supercard, I can understand wanting to hammer the main stories and make sure that each narrative is hammered home. Despite, a lack lustre showing for this episode, there was a lot of good groundwork laid for No Mercy to build upon.